Q is up to his annual shenanigans. You’ll be required to stabilize Omega Particles found in various social zones in Star Trek Online. 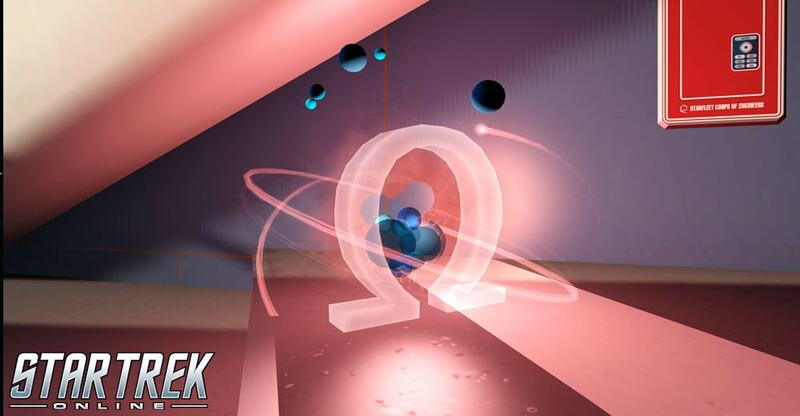 Talk to Q to get the mission “Omega Stabilization (Daily)” and you will be given three zones to visit where you must stabilize an Omega Particle by playing a minigame. The minigame is simple - Omega molecules will fall in from the left in one of four channels. Captains will use either the keyboard or the mouse to move the capture device into the correct channel as the molecule hits the right-hand line. The more molecules you capture, the more Omega molecules you’ll safely dissipate, and the more points you will score. Q doesn’t care how many points you score, just that you completed the minigame in order to receive credit for his mission, but the points do matter. The more points you score, the better chance you have at scoring better quality Omega particle remnants which can be used with the R&D system to craft special Omega Upgrade Kits. Omega Traces come in the three different colors of the Omega nodes themselves. Using the R&D system you can combine 1 of each Trace into an Omega Sliver. You can them combine three Omega Slivers into an Omega Shard, and three Omega Shards into an Omega Fragment. Three Omega Fragments can then be combined into an Omega Upgrade Kit. Completing the minigame will score you a single Omega Trace at the very least. The better you score, the greater your chance to win Omega Slivers, Shards, or even Fragments. Tier 6 Vulcan T'Pau Scout Ship! Enjoying our anniversary events can net you a brand new ship! It'll unlock via a anniversary reputation project, and costs 1,000 9th Anniversary Prize Vouchers. You'll receive 200 Vouchers for completing each of the new missions, "Para Pecum" and "Illusion of Communication" for the first time. The others you can earn by playing Q's Omega Molecule Stabilization game. Collect a thousand and the ship is yours for every character on your account! The full stats for this ship will be discussed in an upcoming developer blog. But that’s not all the problems Q is bringing to you. Once a day, you can complete the mission Party Patrol, and help Q round up tiny little versions of himself running around Starfleet Academy and the Klingon Academy. Catch them, and they’ll make you play a devious game. Win to earn great rewards, like Dilithium Ore, Reputation Marks, or Fleet Marks! By participating in the anniversary celebrations, you can unlock nine brand new emotes! Check out this one, modeled by our own Desperate Trill! Oh god, remind me to never ask him to do anything again.